Blue Crabs get their name from the blue coloring on their legs and claws - their bodies are generally grey or brown. They molt, which means they shed their old shell as they grow and a new shell forms. Blue crabs can live in both fresh and salt water. Origin: Nova Scotia, through the Gulf of Mexico, and as far south as Uruguay. Diet: anything they can get hold of, including mussels, snails, fish, plants, and even carrion and smaller blue crabs. 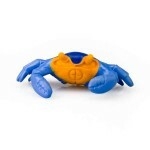 Print the Blue Crab Character Card! Female blue crabs mate only once in their lives. 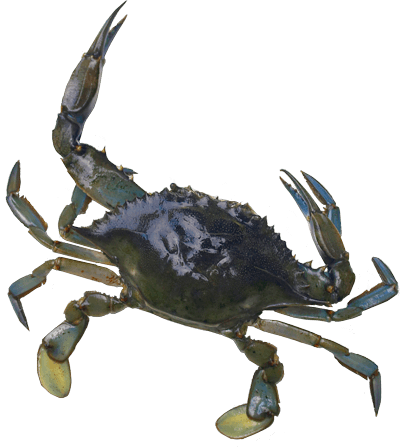 Blue crabs play a n important role in managing the populations of the animals they prey on. Crabs grow by shedding their shells, a process called molting. With three pairs of walking legs Blue Crabs they generally walk sideways.